I could say this every day and week, but you are getting so big! You have a mouth full of teeth and a head so full of hair I finally had to chop off your curls. Fortunately there are a few still back there. Along with getting big, you are also getting opinionated. 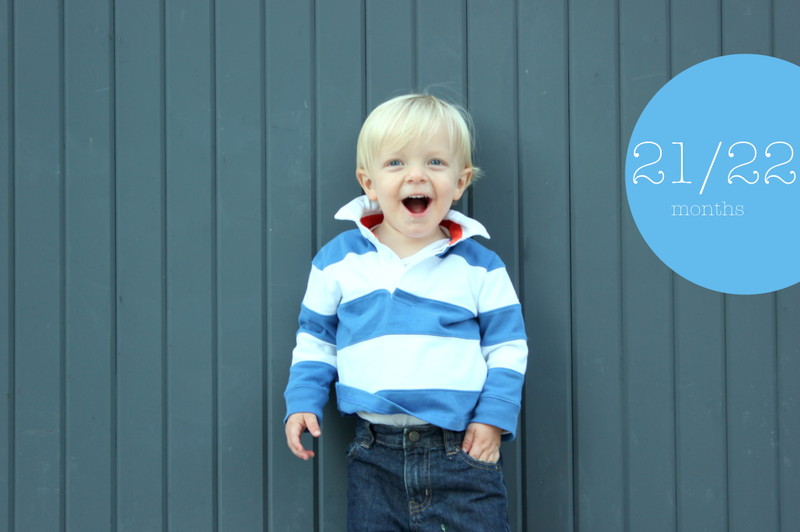 Someone said something about the "twos," that I am just going to ignore, but you sure seem to have them already. One of your favorite words is "mine" and your dad jokes that he can't tell who says "no" more - you or me! Along with this new found independence (you can officially break out of our apartment) you are becoming a night owl, fighting sleep with all your might. Remarkably, you still wake up at the crack of dawn. I think it is secretly because you like to cuddle in bed with us in the morning. It is getting colder out now, which means you never leave the house without your hat and jacket, even if the forecast is unexpectedly sunny. You love these two items and practice putting them on and taking them off. You are getting especially good at zipping things up. You also have an opinion about your clothes these days. You like to pick out your shirt and always wear your favorite shoes. You are constantly eating and never want dinner. What is up with that? I can't get you to eat "dinner" no matter what time I feed it to you and how many snacks I have or haven't given you. You are letting me take pictures of you again, but on your own terms. You strike poses for me which make your dad and I crack up. Behr, you are funny. You might be the funniest member of our little family and we are so grateful for that. Most of all, you love to help. Even when it isn't actually helpful. You like to get out the dustpan and sweep the floor, you help clean up your toys each night, and put the pillows in the right spot on the couch. But some of your habits well... you unload the dishwasher when it is dirty, start it when it isn't full, and open it while its running. There is something about you and the dishwasher. You have always had an affinity, I just hope to continue to foster this love well into your teenage years. Fingers crossed! In the mean time, we hope you keep making us laugh so hard it hurts, because those always end up being the best moments with you. p.s. each day I am more certain that you are going to be a terrific big brother. he is adorable. love the little hand in his pocket. the hand, oh that is totally his new thing. it melts my heart. his face in the first photo totally reminded me of Quinn. The dishwasher cracks me up! That last picture of Behr has melted my heart. He's so adorable. I just want to set him up with my niece so they can be adorable together. He is definitely a blogger's son with all of those poses! Can't wait to do this with my two little ones soon.